Info édition : Collects Low #1-6. Résumé: Millennia ago, mankind fled the earth's surface into the bottomless depths of the darkest oceans. Shielded from a merciless sun's scorching radiation, the human race tried to stave off certain extinction by sending robotic probes far into the galaxy to search for a new home among the stars. Generations later, one family is about to be torn apart in a conflict that will usher in the final race to save humanity from a world beyond hope. 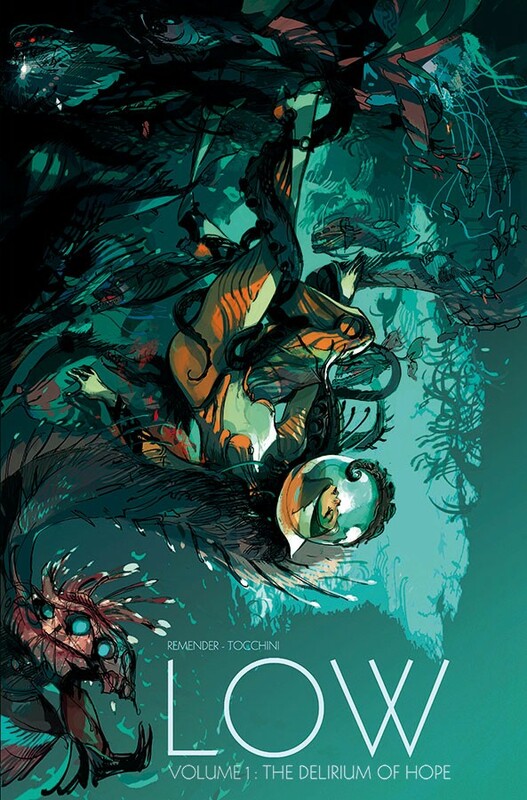 Dive into an aquatic fantasy like none you've ever seen before, as writer Rick Remender (Fear Agent, Uncanny Avengers) and artist Greg Tocchini (Last Days of American Crime) bring you a tale mankind's final hour in the cold, deathly dark of the sea.